Price list 2018 of Kenstar Climitizer Classic Air Cooler. 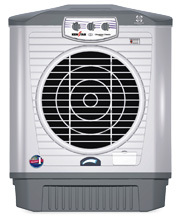 Kenstar Desert Cooler Prices includes latest price of this model of Air Cooler with latest features. Lowest Prices of Kenstar Air coolers is listed here for you to buy online latest Kenstar Air Cooler at cheap rate. Features of this Desert Cooler are Larger cooling capacity: 55 Sq. Mtrs., Suitable for dry and arid climates, Ideal for big halls, banks ,offices & Restaurant etc., Water tank capacity 40 Liters. for longer cooling, Corrosion-free, thermally re-engineered plastic body, Trolley (optional), 6 blade powerful fan. Larger cooling capacity: 55 Sq. Mtrs.